Background: Rheumatic heart disease is the most common cardiac disease in Yemen. It is associated with high morbidity and mortality. Valve replacement is the most common open heart surgery procedure in our cardiac center. The use of mechanical valves remains burdened with serious complications such as thrombosis. Valve thrombosis is still associated with high mortality ] The reported mortality rate of the redo operation ranges from 8 to 20% and up to 37-54% in critically ill patients. Objective: The aim of the present study was to investigate mechanical valve obstruction among Yemeni patients. Patients and Methods: Between January 2003 and April 2007, 2794 patients underwent prosthetic valve replacement in our center, Al-Thawra Hospital. Of those patients, 129 (4.6%) underwent reoperation for te obstructive mechanical valve. Patients with clinical suspicion of prosthetic valve obstruction (PVO) were admitted emergently to the CCU and the diagnosis was confirmed with echocardiography. All patients had heart failure; 95% of them were in NYHA class IV. All were transferred directly from the CCU to the operating room. The mean age was 34.8 ± 13.4 years. Two patients received preoperative thrombolytic therapy that was not successful. Obstruction involved the mitral valve prosthesis in 47 (36.4%); the aortic prosthesis in 16 (12.4%) patients; both valves in 21 (16.3%) patients; mitral valve replacement with tricuspid valve repair in 22(17%); double valve replacement with tricuspid valve repair in 1 (0.8%); redo mitral valve replacement with aortic valve cleaning in 7 (5.4%) cases; aortic valve cleaning in 5 (3.9%) patients; mitral valve cleaning in 5 (3.9%); and 5 (3.9%) patients had redo mitral with aortic replacement. Results: The operations were performed urgently. The etiology of the obstruction was thrombus in 111 (86%), pannus formation in 4 (3%), pannus and thrombus in 6 (4.8%), vegetation in 7 (5.4%) patients, and interposition of suturing materials in 1 (0.8%) patient. The in- hospital mortality was 23/129 (17.8%). Conclusion: The incidence of prosthetic valve obstruction remains high in Yemen. The vast majority of the patients who are referred to our hospital come from remote provinces in the country where regular INR measurement is not readily available. For those who are living in areas without good medical care, certain measures are necessary to avoid this disastrous complication: (1) good patient education, (2) free INR testing and free anticoagulant drugs such as warfarin; and (3) use of tissue rather than mechanical valves. Rheumatic heart disease is the main cardiovascular disease in Yemen affecting children and young adults. The incidence of rheumatic fever and rheumatic heart disease is 1/1000 in the developing countries with high morbidity and mortality. Between January 2003 and December 2007, 4783 operations were performed at the Cardiac Centre of Al-Thawra Hospital. A total of 2794 (58.4%) of these patients were operated upon for prosthetic valve replacement. This number includes valve replacements with or without coronary artery bypass or other cardiac procedures. One hundred twenty-nine of those patients presented with PVO. All patients were admitted as an emergency to the CCU with clinical suspicion of PVO. The diagnosis was confirmed by transthoracic echocardiography in all patients. Transesophageal echocardiography was performed in 24 patients (31%), and cineangiography in 10 patients (7.8%). The obstruction of the prosthetic valve with pulmonary edema and NYHA class IV was present in 123 cases (95.3%), and 7 patients (4.7%) were in NYHA class III. Thrombolytic therapy was tried in two patients, which was not successful. Inadequate anticoagulation level as measured with International Normalized Ratio (INR) was found in most patients. An INR less than 2 was detected in 87 (67.4%) of the patients. The mean INR level in these patients was 1.43 ± 0.24. All patients were transferred to the operating room and urgent redo operations were performed. The right femoral artery was cannulated in 12 (9.3%) patients. The right femoral artery and vein were cannulated in 7 patients (5.4%), and the ascending aorta was cannulated in 122 (94.6%) patients. Venous cannulation was performed bicavally, or by cannulating the superior vena cava together with the right femoral vein. A vent cannula was inserted into the right upper pulmonary vein for left ventricular venting in all patients. Antegrade hypothermic, blood, or crystalloid cardioplegia was administered for myocardial protection; 28-30ºC systemic hypothermia was maintained. In some cases, where the mitral valve was exposed following the right atriotomy, the transseptal approach was preferred due to severe adhesions. The aortic cross-clamping time ranged from 29 to 190 min and the mean time was 85.5 ± 36.4 min, and total perfusion time (TPT) was 135.3 ± 68.73 min. 129 patients with PVO were studied retrospectively over 5 years (2003-2007). 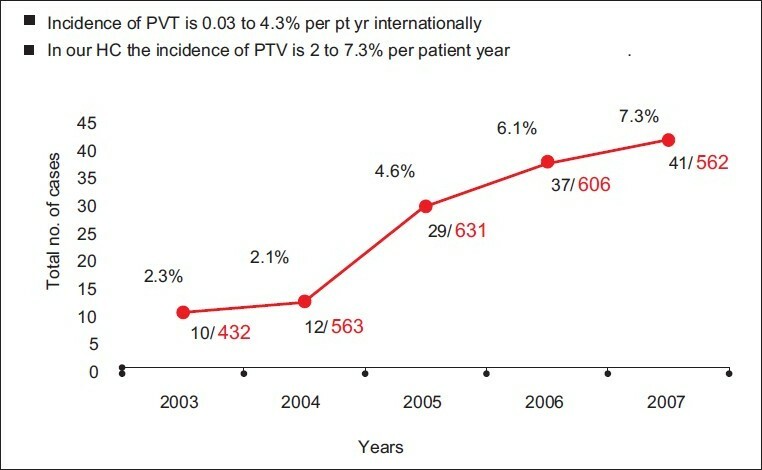 The incidence of PVO during this time is shown in [Figure 1] and [Figure 2]. The mean age of patients was 34.8 ± 13.4 (range, 10-70) years. Seventy-five patients (58%) were females and 54 patients (42%) were males. The mean time interval between first prosthetic valve implantation and valve dysfunction presentation was 2.2 ± 1.6 years (range, 4 days to 20 years). 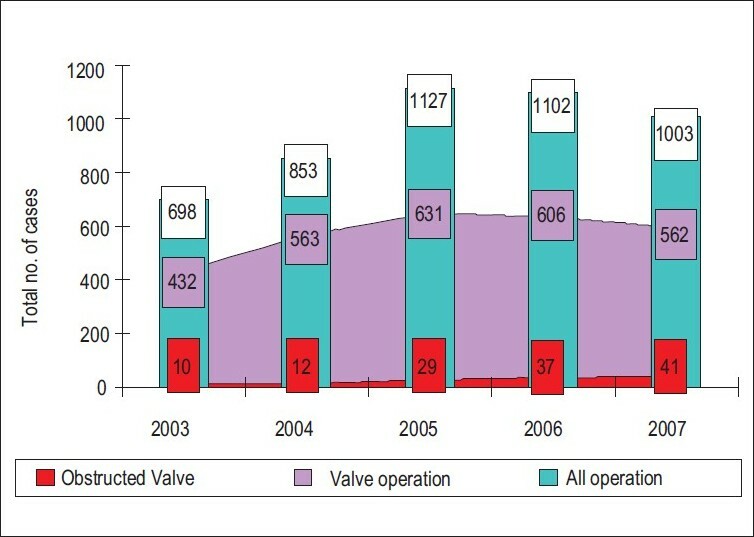 The causes and incidence of prosthetic valve obstruction are shown in [Figure 3]. Thrombus was found in 111 (86%) patients, pannus formation in 4 (3%), pannus and thrombus in 6 (4.8%), vegetation in 7 (5.4%), and interposition of suturing materials in 1 (0.8%). Prosthetic aortic valve obstruction was documented in 50 patients; 44 (88%) of them were bileaflet prostheses, 30 of which were St. Jude Medical, 3 CarboMedics, 10 Mira-Edwards, and 1 Sorin-Bicarbon; 4 (8%) were tilting-disc valves, and 2 (4%) were caged-ball valves. There were 108 mitral prosthesis obstructions involving bileaflet valves in 102 (94.4%) of 108 patients (79 St. Jude Medical, 2 CarboMedics, 1 Sorin-Bicarbon, 20 Mira-Edwards), and tilting-disc valves in 6 (5.6%) patients. Of the 129 patients with proven prosthetic valve obstruction, 47 (36.4%) patients underwent mitral valve surgery, 16 patients (12.4%) had aortic valve surgery, and 21 (16.3%) had both aortic and mitral valve operations. Twenty-two (17%) patients had mitral valve replacement with tricuspid valve repair, 1 (0.8%) had double valve replacement (DVR) with tricuspid valve repair, 7 (5.4%) had redo mitral valve replacement with aortic valve cleaning, 5 (3.9%) had aortic valve cleaning, 5 (3.9%) had mitral valve cleaning, and 5 (3.9%) had redo double valve replacement [Table 1]. Intensive Care Unit (ICU) stay was between 4 and 22 days. Eighty-two patients were transferred from ICU to the ward without complications. Forty-seven patients had complications during hospitalization; two patients had bleeding; CVA developed in four patients, and two of them expired. Five patients developed renal failure which required dialysis, three improved, and two expired with multiorgan failure. Nine patients had prolonged intubations due to severe chronic obstructive pulmonary disease (COPD), three of them required tracheostomy; five patients expired due to multiorgan failure and sepsis. Two patients developed hepatic impairment and were managed successfully. 18 patients developed cardiogenic shock, 15 of them expired. Two cases were complicated and one case expired due to other causes. The total in-hospital mortality rate was 17.2% (23 patients). Rheumatic heart disease is the main cardiovascular disease in Yemen and it is associated with a high morbidity and mortality. Valvular replacement with a mechanical valve is the main therapy for advanced valvular heart disease. Mechanical valves need lifelong anticoagulation therapy. The increased incidence of valve dysfunction observed in this series can be explained by the increased number of valve replacement operations performed at our cardiac center year by year as shown in [Figure 2]. The main causes of the observed high incidence of prosthetic valve obstruction are poverty and lack of adherence of patients to medical instructions especially anticoagulant therapy. Our protocol for anticoagulation therapy is to keep the therapeutic level of INR between 2 and 3.5 in patients undergoing mitral or aortic mechanical valve replacement, and between 2.5 and 4 in those undergoing double mechanical valve replacements. Patients receive information regarding the importance of anticoagulation for their prosthetic valves and for their lives. Warfarin dose is adjusted before discharge to reach the desired INR level. Patients are asked to come back to the cardiac center 2 weeks after discharge. However, the vast majority of the patients are referred to our hospital from other provinces of the country, where a regular INR measurement is usually not available. Therefore, it is impossible to say exactly whether anticoagulation is kept within therapeutic range in all patients in the follow-up period after 2 months. Most of the patients who live in towns and villages where there are no facilities to check the INR are probably not following the required level. Others may be not taking anticoagulation either because of poverty, or because they do not follow the medical instructions; still, others may not be monitoring their INR and consequently, inadequate anticoagulation levels were detected in 67.4% (87 of 129) of patients in this study. The mortality rate in PVO is greater in cases with thrombus than with pannus. This is related to rapid hemodynamic deterioration associated with valve thrombosis. Acute thrombus is less common in bileaflet than in tilting disk mechanical prosthetic valves. However, in our study, PVO was observed in 117 of 129 (90.7%) patients with bileaflet mechanical valves. Nonsurgical management such as thrombolytic therapy can also be administered to patients with prosthetic valve obstruction due to thrombus formation. In this study, two patients received thrombolytic treatment preoperatively but thrombolysis failed in both patients. The transvalvular gradient remained high and the patients had to undergo cardiac surgery. Prosthetic valve dysfunction is an emergency condition with hemodynamic deterioration and high mortality in valvular reoperations. The high incidence of valve thrombosis among Yemeni patients necessitates urgent steps to find solutions to avoid this disastrous complication. For those who are living in areas without good medical care, there are a number of measures that could be taken: (1) good patient education pre- and postoperation; (2) provision of free anticoagulation drugs such as warfarin; (3) closer attention to INR level monitoring could be achieved with the distribution of free INR kits; and (4) use of tissue valves rather than mechanical valves. All these may be good solutions to address this problem. 1. Deviri D, Sareli P, Wisembaugh T, Cronje S. Obstruction of mechanical heart valve prostheses: Clinical aspects and surgical management. J Am Coll Cardiol 1991;17:646-50. 2. Cannegieter SC, Rosendaal FR, Briet E. Thromboembolic and bleeding complications in patients with mechanical heart valve prostheses. Circulation 1994;89:635-41. 3. Berenger FP, Cano JP, Rolland PH. Antithrombogenic endothelial cell defense. Basal characteristics in cultured endothelial cells and modulation by short-term and long-term exposure to isosorbide nitrates. Circ Res 1987;60:612-20. 5. Horstkotte D, Burckhardt D. Prosthetic valve thrombosis. J Heart Valv Dis 1995;4:141-53. 6. Martinell J, Jimenez A, Rabago G, Artiz V, Fraile J, Farre J. Mechanical cardiac valve thrombosis. Is thrombectomy justified? Circulation 1991;84:III170-5. 7. Teshima H, Hayashida N, Yano H, Nishimi M, Tayama E, Fukunaga S, et al. Obstruction of St Jude Medical valves in the aortic position: histology and immunohistochemistry of pannus. J Thorac Cardiovasc Surg 2003;126:401-7. 8. Davies PF, Remuzzi A, Gordon EJ, Dewey CFJ r, Gimtrone MA Jr. Turbulent fluid shear stress induces vascular endothelial cell turnover in vitro. Proc Natl Acad Sci USA 1986;83:2114-7. 9. Sauvage LR, Berger K, Wood SJ. The clinical significance of healing data obtained from study of prosthetic valves in animals. Adv Cardiol 1972;7:25-33. 10. Marbarger JP Jr, Clark RE. The clinical life history of explanted prosthetic heart valves. Ann Thorac Surg 1982;34:22-33. 11. Hinton RC, Kistler JP, Fallon JT, Friedlich AL, Fisher CM. Influence of etiology of atrial fibrillation on incidence of systemic embolism. Am J Cardiol 1977;40:509-13. 12. Wellons HAJr, Strauch RS, Nolan SP, Muller WH Jr. Isolated mitral valve replacement with the Kay-Shiley disc valve. Acturial analysis of the long-term results. J Thorac Cardiovasc Surg 1975;70:862-8. 13. Kosar F, Gullu H, Sahin I, Aclkgoz N, Topal E, Erdil N. A case of vasospastic angina resulting from coronary emboli in a patient with prosthetic valves. Jpn Heart J 2004;45:325-30. 14. Bortolotti U, Milano A, Mossuto E, Mazzaro E, Thiene G, Casarotto D. Early and late outcome after reoperation for prosthetic valve dysfunction: analysis of 549 patients during a 26-year period. J Heart Valve Dis 1994;3:81-7. 15. Rizzoli G, Guglielmi C, Toscano G, Pistorio V, Vendramin I, Bottio T, et al. Reoperations for acute prosthetic thrombosis and pannus: an assessment of rates, relationship and risk. Eur J Cardiothorac Surg 1999;16:74-80. 16. Ozkan M, Kaymaz C, Kirma C, Sφnmez K, Ozdemir N, Balkanay M, et al. Intravenous thrombolytic treatment of mechanical prosthetic valve thrombosis: a study using serial transesophageal echocardiography. J Am Coll Cardiol 2000;35:1881-9.